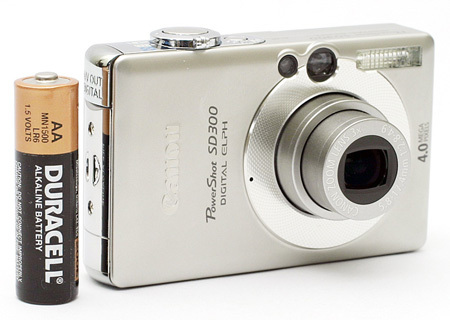 The Canon SD line is very popular for its small size and solid construction and the PowerShot SD300 is no different. Offering a 4 megapixel output and 3x optical zoom, the SD300 has a lot to offer. On top of the basic still recording modes that we have come to expect from current digicams, the SD300 offers a versatile movie mode that can record at 640x480 at 30 fps. It can even record at 60 fps with a resolution of 320x240. Despite its size, the SD300 features a luxurious 2.0 inch LCD monitor. Also, the SD300 is a unique ultra-compact camera in the sense that it has an AF-assist lamp and optical viewfinder. In our review of the SD300, we found that it could quite possibly be the best ultra-compact digicam available. Although it carries a heavier price tag than some similar ultra-compact cameras that are a bit bigger, the SD300 puts in a very solid performance in our tests. It is fast from startup to shutter lag. It even has remarkable cycle times with and without use of the flash. We were blown away by its continuous drive mode that is capable of shooting at 2.4 fps until the flash card is full. When it comes to image quality, there are a few minor quibbles, but nothing that detracts from the overall quality. Read our full review of the Canon PowerShot SD300 to see the details and why we love it so much.